Stanley Yelnats is accused of a crime he did not commit. He is sentenced to a boys camp in the middle of a bone dry desert. The camp is ironically named Camp Green Lake. Day in and day out the boys at the camp must dig holes in the scorching heat for the warden. This story has multiple perspectives. Stanley's present day and the past of Stanley's great-great grandfather as well as the past of Camp Green Lake. 'Holes' is much more gritty than the average middle school novel. Its is definitely not all fairies and unicorns. There are some somewhat harsh scenes in the story but they are important part of the book . 'Holes' is a story about overcoming adversity and a deep message about good triumphing over evil. As for the cast of characters in the novel they are definitely unique. With names like Armpit, Zero, and X-ray how could they not be. This story is told with a lot of tongue-in-cheek humor. The whole thing with Stanley talking about his no-good-dirty-rotten- pig-stealing-great-great-grandfather is just hilarious. It's also really funny about that whole thing with Stanley's name being spelled the same both backward and forward. I think that this was great fun to read. I enjoyed reading this book, it wasn't really sad and depressing as some books try to be, but it makes you laugh and is just amazing. The misunderstanding with the shoes, and with Stanley ending up in a juvenile detention centre in the middle of nowhere with a bunch of stocky hunks of boys. I just loved this book! Stanley Yelnats is under a curse. A curse that began with his no-good-dirty-rotten-pig-stealing-great-great-grandfather and has since followed generations of Yelnats. Now Stanley has been unjustly sent to a boys' detention center, Camp Green Lake, where the warden makes the boys "build character" by spending all day, every day, digging holes: five feet wide and five feet deep. It doesn't take long for Stanley to realize there's more than character improvement going on at Camp Green Lake. The boys are digging holes because the warden is looking for something. I thought it was really clever to have Stanley's last name to be the same spelt backwards. I have never encountered an idea like that, and it made me laugh when I realized it, or was it when the book told me, I don't know. I also thought it was really strange to be digging holes in a dried up lake, but when the secret was revealed, I was just stunned. I love this book, as does everyone else. It is full of everything you'd ever want. The movie is great as well, and it is well worth seeing it. Please read this amazing book! To me, this book was a great blend of comedy and drama. Stanley falls into a terrible situation, the victim of a wrongful conviction, that sends him to a juvenile detention camp. Between his oddball fellow campers, the malevolent counselors, and the larger than life figures from the past that are affecting the present, we get to read about some very memorable characters. I love the whole curse aspect, and the way Stanley is always fighting against that, and Kate Barlow's "you'll never get the best of me" attitude, with the way she hides her treasure, is awesome. You want so badly for Stanley and the other kids to find a way to defeat the counselors, and take the camp down, and that back and forth struggle feels very real in this book. There are ups and downs and an ending that is very well done. I think I read this during middle school. I'm not sure, but it is on the bookshelf in my room, so I had to have read it at one time or another! My favorite part is the friendship between Stanley and Zero, and the way it all came together in the end! I also never miss a chance to watch this movie any time it comes on TV. It's just so good! Stanley Yelnats is a young teenage boy who was sent to Camp Green Lake located in Texas. This camp isn’t any ordinary camp, but a juvenile detention camp for young teenage boys. 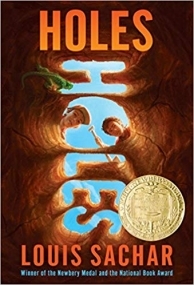 In the book Holes, written by Louis Sacher, the boys who are sent there have to dig large holes every day, being told that it will build up their “character”. Stanley says he was sent there because of his no-good-dirty-rotten-pig-stealing great-great-grandfather, his great-great-grandfather was cursed by a gypsy after he had broken a promise long ago; a curse that would be passed down to all generations after him. In Camp Green Lake Stanley learns things slowly, made new friends, and understands how things go at the camp. But there was one thing Stanley couldn’t understand, out of all things to do in a detention camp, why were they digging holes? He soon realizes that this wasn’t an ordinary “character developing” juvenile camp, but instead, the boys were digging for something, something valuable and important. Stanley slowly pieces the clues together and digs up this mystery hole and tries to break the curse of his no-good-dirty-rotten-pig-stealing great-great-grandfather. Holes is a novel you will definitely want to read again if you have the chance, the book acts like sticky glue, once you pick it up, you will never be able to let it go until you’ve finished it. A few reasons why is because: the book is very unpredictable; opposite things happen from what you’re thinking will happen. Louis Sacher made the plot simple yet interesting so the book wouldn’t confuse readers. The characters in the story are believable and reasonable; they act and do things really realistically and don’t do impossible, beyond supernatural tasks. Characters are also dynamic, changing throughout the story in order for them to adapt and survive in the harsh conditions facing both physical and mental challenges. A few characters that show progression throughout the story are Stanley Yelnats (Caveman) began as a young, naïve, spoiled city boy into a wise, mature, independent teenager. Another character Hector Zeroni (Zero), who went from a young unsocial, blame taking boy, into a kid with friends and self-confidence. Overall, I would rate this book 4 out of 5, the book was very attracting and mysterious, but sometimes it seemed repetitive. The plot, simple yet intriguing, characters being dynamic, believable, the use of language/dialect was perfect. I really enjoyed reading this book, mainly because for me it was adventurous, and unpredictable. In the end, it was like all Disney movies, a happily ever after ending. I would recommend this novel for people who love fictional and adventurous stories. Holes Id seen the movie, watched it a countless number of times, but never really cared about the book enough to buy it. That was until a few days ago, when I was at a Used bookstore and found a copy, priced a cheap $2.80 (or .60, I cant really remember) and purchased it. I didnt read it off the bat, still weary of the whole Book-to-Movie transition. Did the book mirror the movie I loved so much, or did Hollywood distort it like a funhouse mirror? Tentatively, I peeled back the front cover and read. And thank goodness I did!! Now, the book is different from the movie, but not by much and the book even goes into greater detail that the movie just couldnt in its hour-and-thirty-minute running time. I loved the book just as much as the movie, if not more. So, if youre a fan of the movie, I suggest you pick it up. Havent even heard of it before? Well, its a simple tale about a boy set in the wrong place and the wrong time and how he eventually realizes his family isnt cursed and blah, blah, blah. . .Trust me, its amazing, pitiful synopsis or not! Go on then! Pick it up! Youll totally dig it! Holes was a great novel. I could really understand Stanley and his character, which is one of the biggest factors I look for in a book. It had a creative plot, and the author did a great job of writing it. Sachar illustrated friendship greatly in this book, and I would definitely read this novel again. They also made this into a movie. I read this is junior high and loved this book. It teaches you about firendship, being different, and dealing with punishment even when it isn't your fault. The main character--stanley yelnats-- is a good boy in a bad position. He finds himself in a work camp to avoid jail time. But it actually is the best thing that could happen to him. He meants a freind named Hector Zeroni. Holes is the bomb yo!!! Holes is a great book I read in middle school. It's about this boy named Stanley Yelnats whos accuesed of stealing these expensive shoes when he really find them. It's either he goes to juvenile hall or goes to camp Green Lake. It's a camp for bad boys, where he has to dig holes. The reason why they dig holes is because the warden is looking for something, what that is I can't tell you because that would ruin the whole story. If you haven't read Holes you should go and check it out. It's a pretty good story, for adults and children. Theres nothing I didn't like about this story, it's pretty much perfect. That's why I gave it a 5.
this book had great characters zero was my favorite character. i like how the story jumped back and forth through time and to see the stories related to each other. a classic tale of good versus evil and struggles through difficulties. a great coming of age story! First of all, the characters in this book are sadly fugitives. The main character Stanley Yelnats the third or his nickname ''caveman'', was caught with stolen shoes.He was going to be sent to prison or go to Camp Greenlake.The people at camp Greenlake are the fugitives x-ray, magnet, and armpit are the most important characters when Stanley gets there but after a few months he meets zero.He is important because he is the one that STOLE THE SHOES.When he herd sirens coming he got scared and through the shoes over the high way walking under it Stanley who got struck by the shoes.He was sent to greenlake not zero. But zero was caught.THIS BOOK IS A THRILLER FROM BEGINNING TO END.